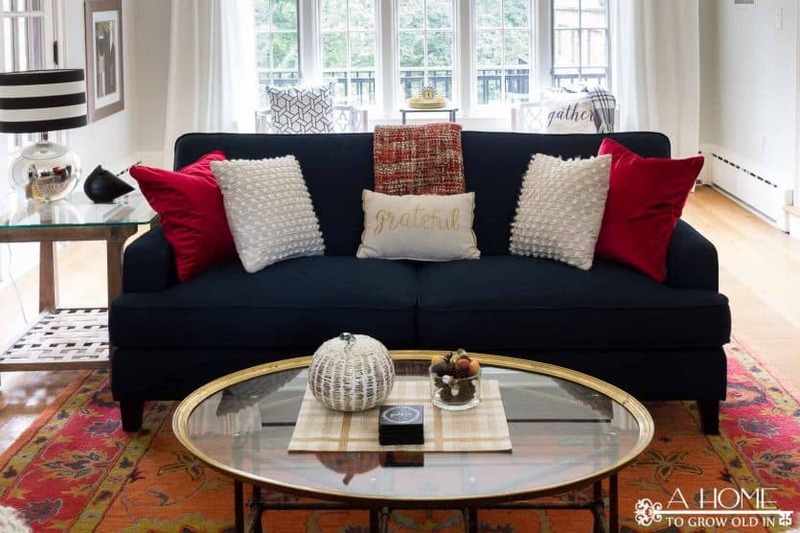 Looking for fall home decor ideas? 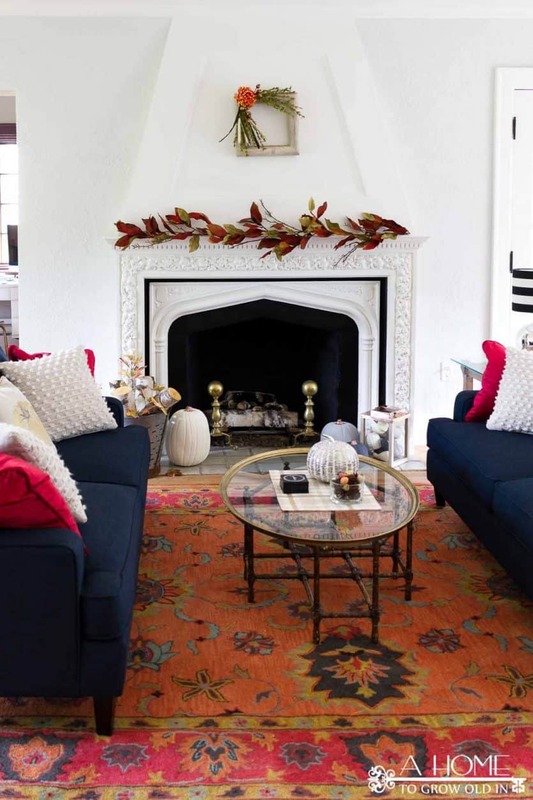 This home tour has lots of cozy inspiration to warm you up! Well, I can hardly believe it, but fall is here! It’s time for cooler temperatures, changing leaves, turtlenecks, and pumpkin spice everything. 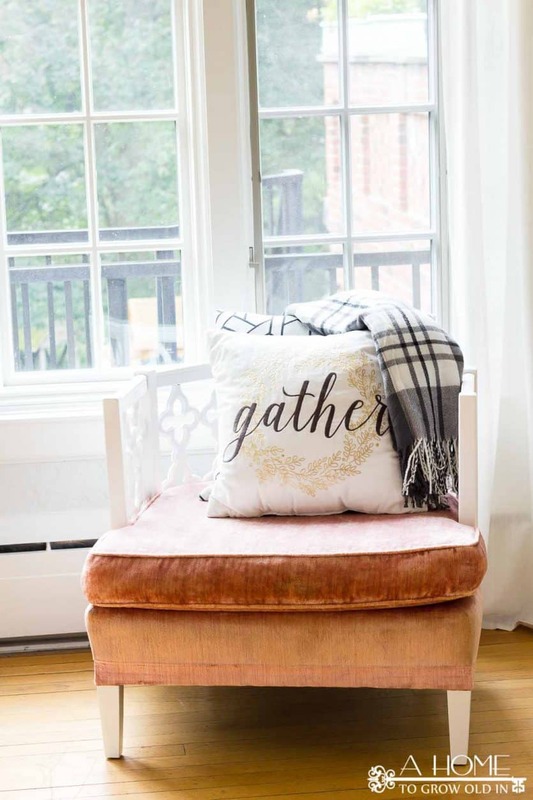 It’s also time for fall home decor tours! 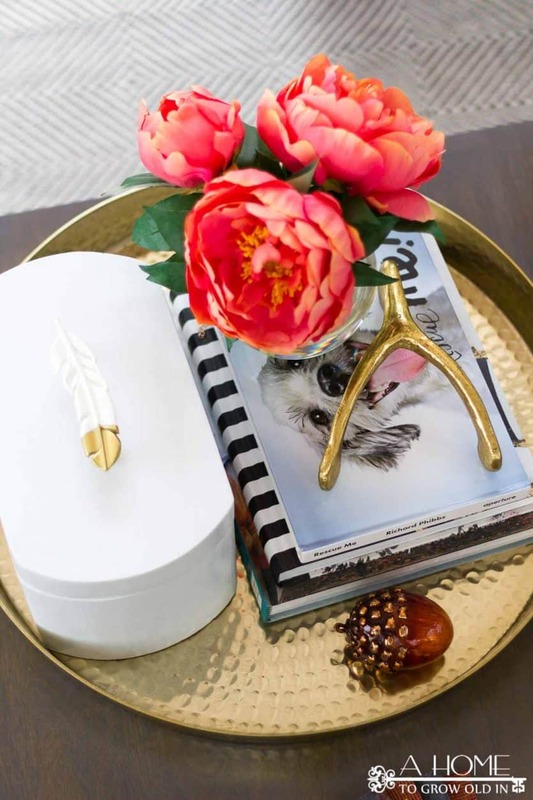 If you follow many home decor blogs, I’m sure you’re starting to see them everywhere. 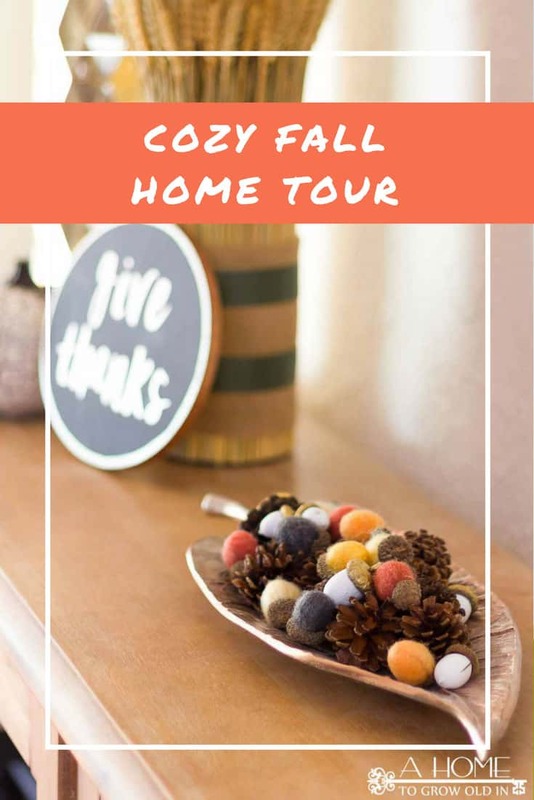 This is a busy time of year for us bloggers with fall, Halloween, Thanksgiving, and Christmas right after the next, but I love to see the fun seasonal updates that everyone does to their homes. I’m happy to be here today with several of my friends, and we are sharing a Fall Tour of Homes. This year I’m breaking my home tour into two parts, and today I thought I’d start with our foyer, family room, and living room. I’ll be back next week to show you a few more rooms. 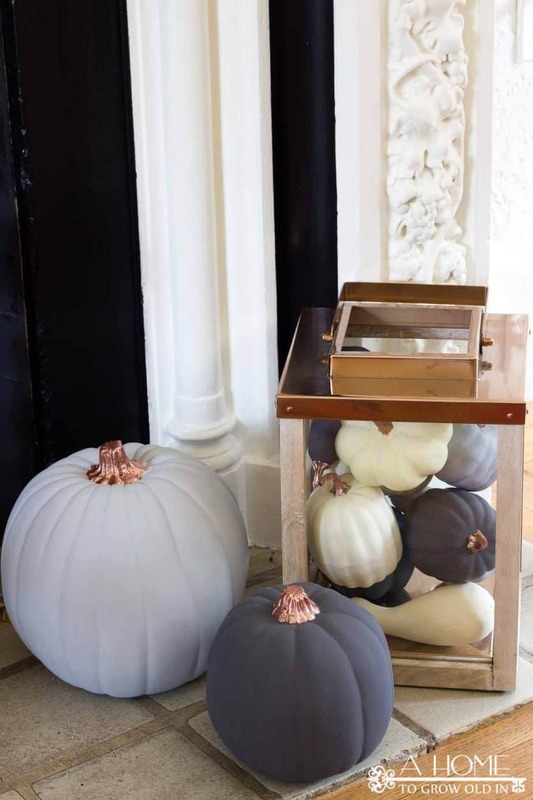 In the meantime, make sure to check out the links at the end of this post for even more fall decor inspiration. So, come on into one of the first rooms you see as you enter into our home, the foyer. If you’re new around here, we moved into a 90 year old home a couple of years ago and have slowly been making it our own. The foyer is one of the rooms in our house that we have not made any updates to yet. It’s a fairly wide room, but it’s not very deep, and it’s sandwiched in between the living room and kitchen. There’s also a staircase that heads to the second floor. Because it’s so wide, I wanted a really long entry table, and this one is the just the right size for the room. We also keep two stools on either side, which come in really handy in the winter for removing snow boots. The pillows are a recent find from HomeGoods, and their charcoal gray color complements a lot of my gray fall decor that I’ve added in recent years. 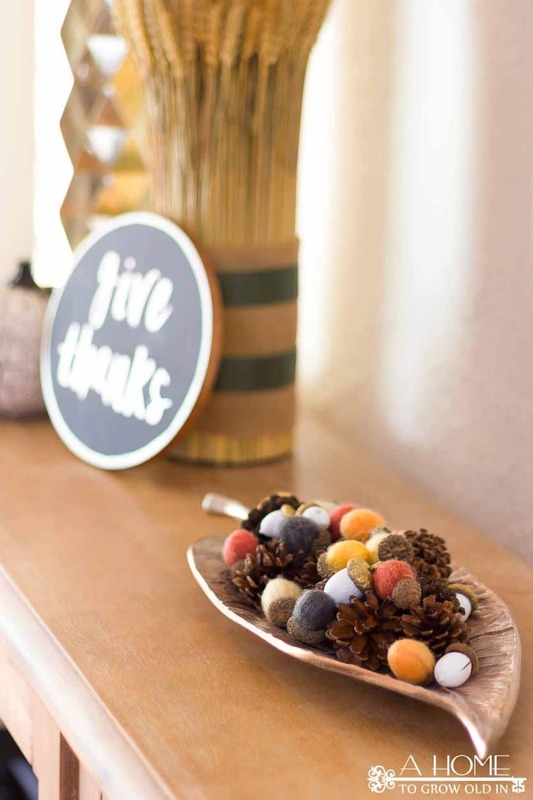 I made this “Give Thanks” sign and included it in last year’s fall home tour. There is also a free printable version of it in the Printables Library that is available to all newsletter subscribers. 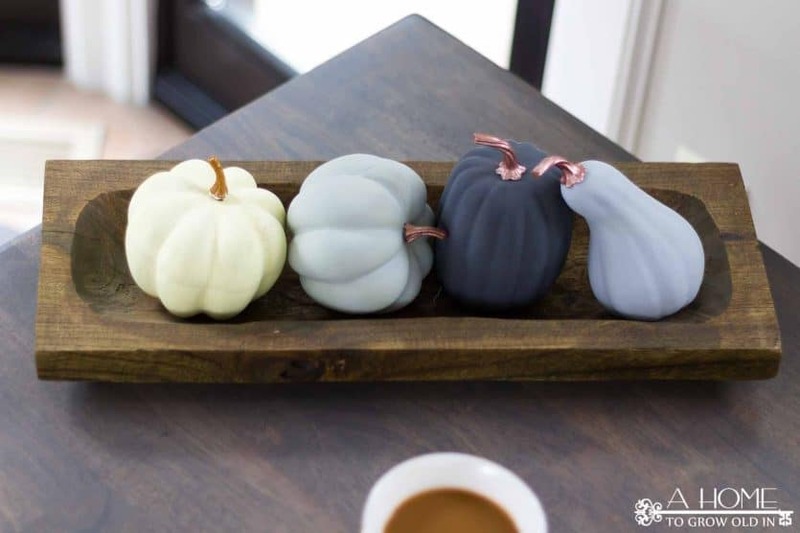 These colorful felted acorns are some of my favorite fall decorations, but I haven’t seen them in stores this year. Luckily, they don’t look difficult to make, and there is a great tutorial if you’d like to make some yourself. 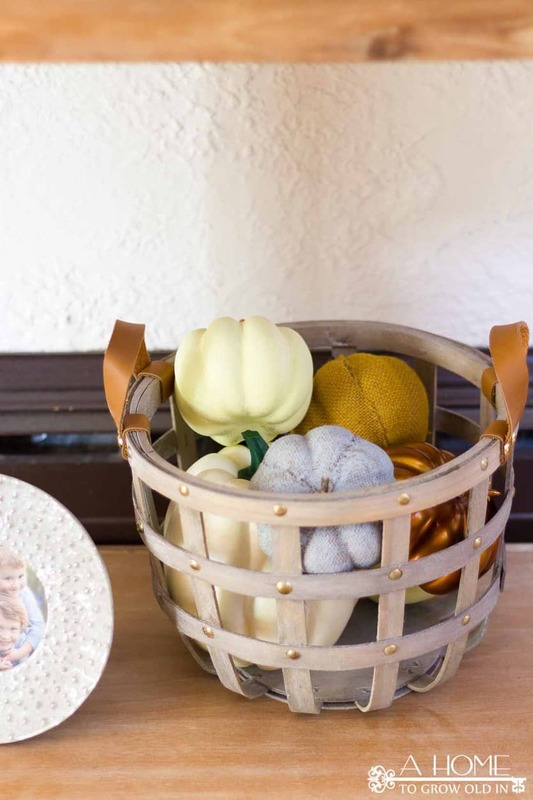 I picked up this leather-handled basket at Michael’s recently, and it’s the perfect size to hold several small pumpkins. Don’t you love those brass tacks? Right off of our entryway is our formal living room. You may remember this square faux wood wreath from last year. It was one of the most viewed posts of the year, and it’s made out of something you’d never expect! When the weather cools off we love to gather in here and warm up in front of the fireplace. There’s lots of seating in here so this is a popular spot when we entertain. Our last stop on the tour for today is our family room. Other than the kitchen, this is the most used room in the house. This is where all our game playing, movie watching, and family hang out time occurs, so we keep it cozy. We had this room painted last year. All of the molding and ceiling were unstained pine that had yellowed in the sun over the years, and I am loving the bright white trim and ceiling contrasting with the black on the doors and windows. This sign is also from Michael’s this year. It’s perfect for this room since we spend so much time in here, and I couldn’t pass it up! 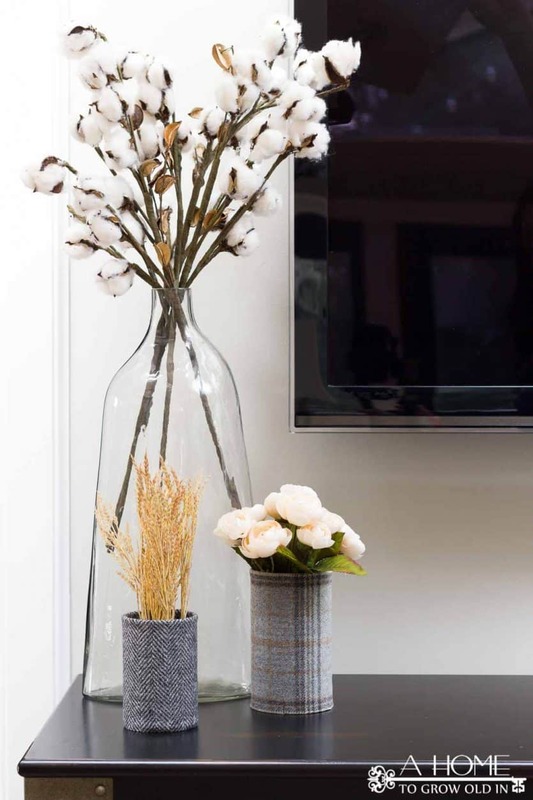 These fabric wrapped vases are a super easy DIY that I will be sharing in the next couple of weeks. I love how cozy they make the room feel! That’s it for Part I of this year’s fall home decor tour. I hope you’ll stop back next week to see more of our home. 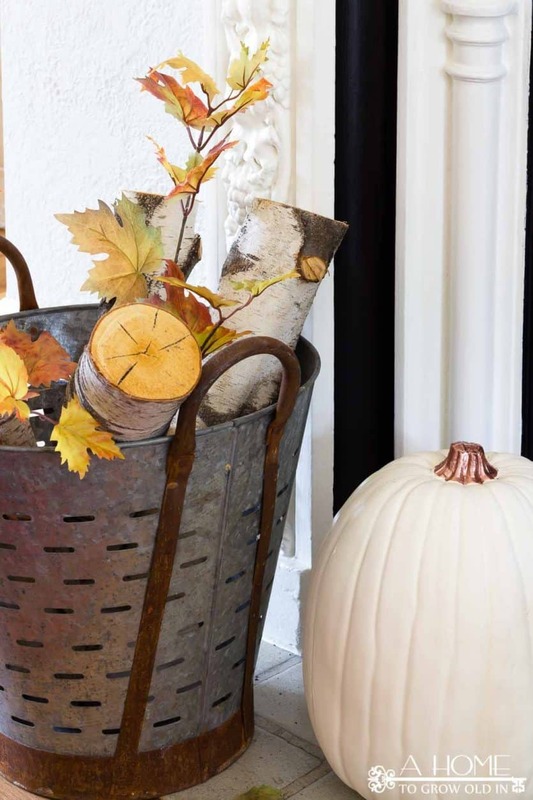 The fall home decor doesn’t have to stop here, though. Take a look at my friends’ gorgeous homes at the links below as they get ready for the season! Robin, Your home is beautiful! I am not just admiring your fall décor but I am loving your whole house. I especially love the pumpkins in the dough bowl. 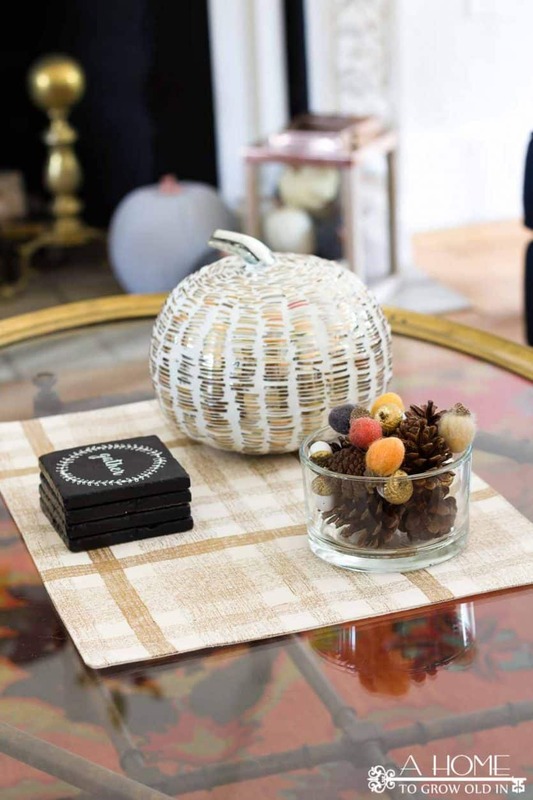 You have the gift of decorating and the touches of fall that you have added is beautiful! Wow, Sherry! That is quite the compliment! Thank you so much! Seasonal decorating is my favorite. It’s fun taking out pieces I’ve collected over the years and finding new ways to use them. Your home is beautiful! It was so fun taking a peak at some new spaces that I haven’t seen before. Love the way each detail is beautiful added to create a comfy space. Perfect for fall. But..I have to admit…that clock by the television caught my attention the most. So unique! Love it!! Tammy, I love that clock, too! I love it so much that I’m thinking about getting a second one! Would it be too much if I kept them on different floors of my home? Robin, I love your home! It has so much character, and I love your family room with the white ceiling and black windows, it’s to die for! I love how several of your pumpkin stems are copper, and your home looks perfectly cozy for Fall. My favorite photo of all is the one with the vintage looking chair with the gather pillow. That one gives me all the Fall feels! Thanks, Nicki! You are too sweet! That chair is probably my favorite piece of furniture in my entire home! Everything looks cozy and festive at the same time. Great colors! Thanks, Cindy! I love a lot of color, and fall color is so beautiful! Robin, I love it! You’ve pulled together fall beautifully! Your home is gorgeous my friend. Oh Robin, I realized long ago that I love your home so much and this post just reminded me again! It is really lovely with so many fine touches characteristic of an older home…can you see my green eyes through the screen! 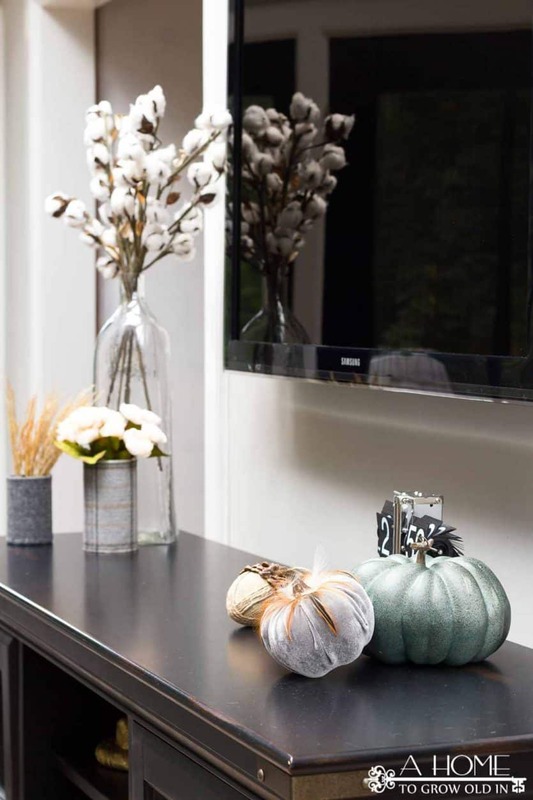 And the fall touches that your incorporate into your home just really speak to cozying in on cold days. Of course, you know I am partial to that incredible wreath you made last year and it’s not a surprise that it’s one of your most popular posts…it’s brilliant. In fact, I love the simplicity of your living room fireplace…it’s just perfect. And thanks for featuring my needle felted acorns! Lynn, you’re so funny and sweet! Thank you! Having an older home has its challenges, but I just love its character. And, I just love your acorns, and I can’t wait to try my hand at making your felted pumpkins! Robin, Your house is just my style! I love how you’ve decorated it for fall, but I also love all the character your house has. 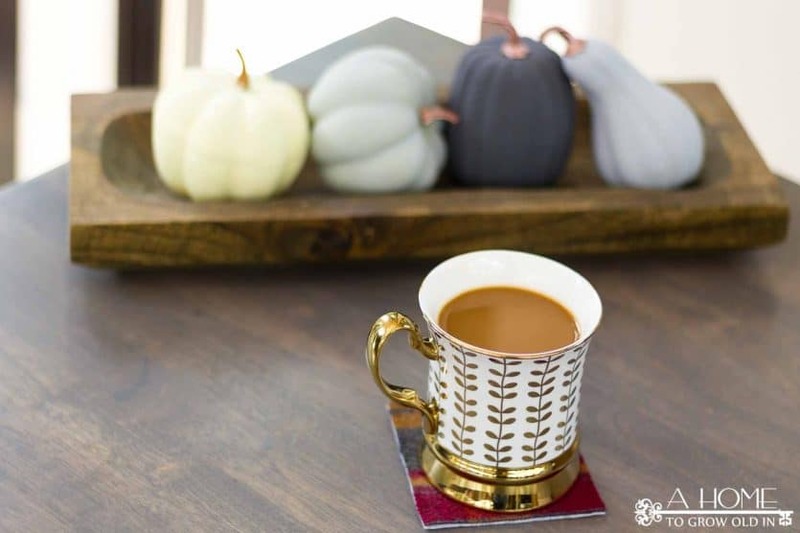 Those felt acorns, the fall leaves in with the birch logs, and even the plaid coasters I noticed are all such great fall touches. And I really love all the black trim in your white family room! Hi, Carol! 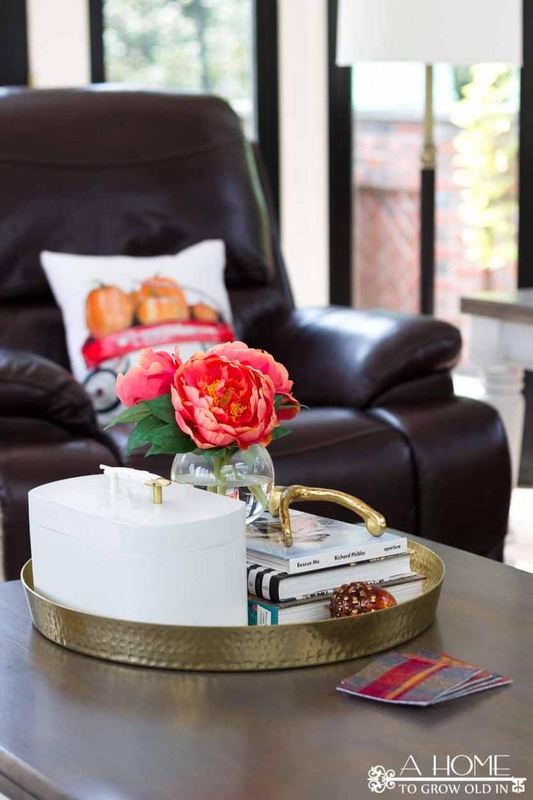 Fall is one of my favorite times of the year to decorate, and it’s a lot of fun to add little touches throughout the house. Thanks so much for checking it out, my friend! Your home is gorgeous! I love the contrast of your colorful furnishings against the white walls. So pretty! Thanks for checking it out, Stacy! I love having some color, and white walls make a great palette! You have a beautiful home and I’m in love with your soft colour palette of blues and greys. So serene, and your pumpkins look amazing. Loved this home tour. Thank you for sharing. 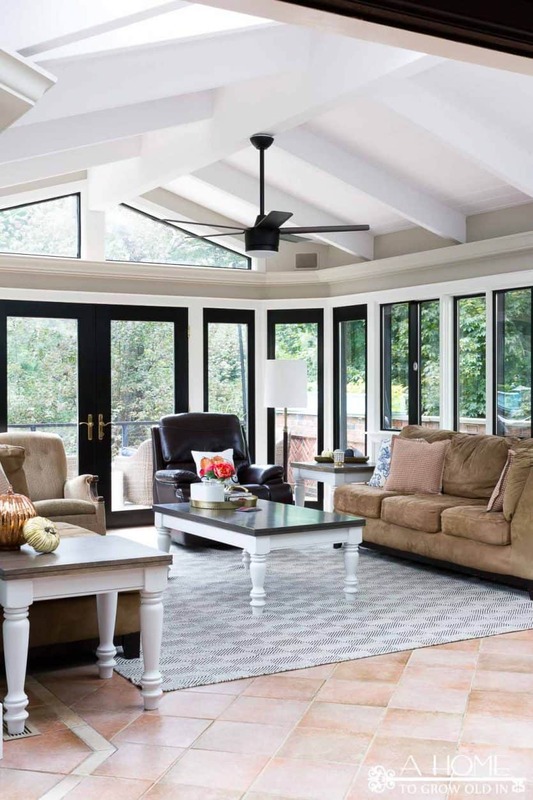 I LOVE, your family room-those ceilings are stunning!! The colors in your formal living room are so pretty. Love the couch color. You have such a beautiful home! Your home is so amazing! My mouth fell open! 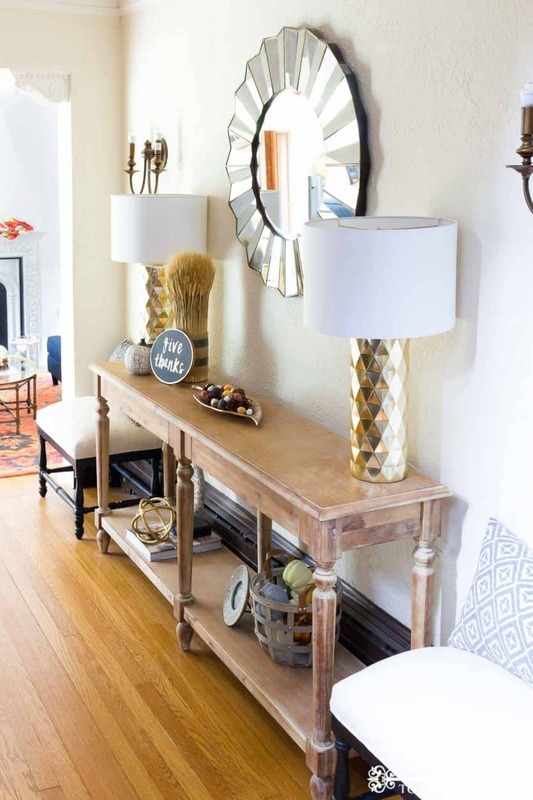 I love the gold lamp and the crackle pumpkin! You really do a fabulous job of blending the modern and the vintage! Your fireplace is a showstopper all on it’s own! Love it all! 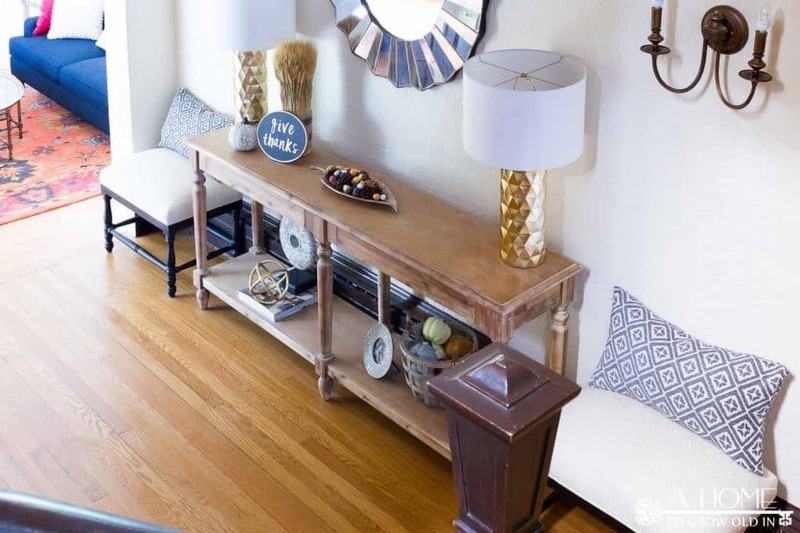 Thank you for sharing your home’s piece. Everything is so beautiful and adorable. Such a perfect home.